Dutch Clouds or Color Icons? Dutch Clouds takes a very unusual approach to the traditional scenic paper or mural. When viewed up close, the design is composed of thousands of multicolored icons arranged in rows. The icons were developed by Martens as a language to express color combinations. Reflecting Martens’ monoprint works, begun in the 1990s, these icons are based on his experiments in color and the results of overlapping colored shapes. 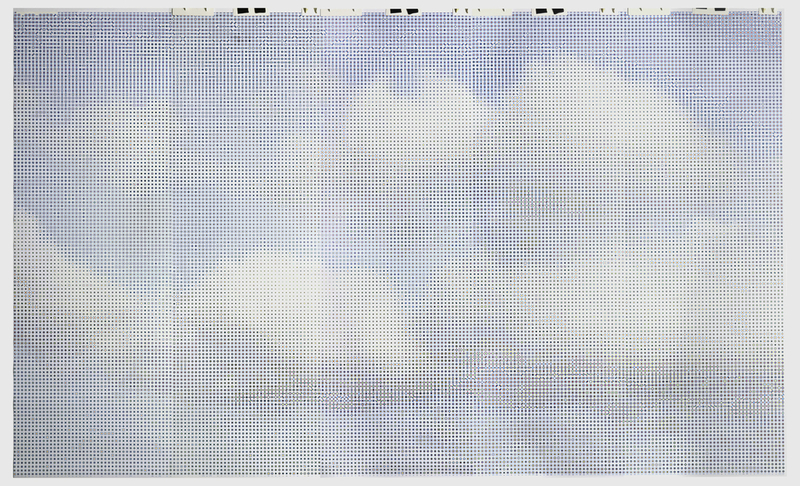 When viewed from a distance, the viewer’s eye merges the icons together to form a design of fluffy white clouds against a blue background. This juxtaposition keeps the design visually interesting and dynamic, as the image appears to change from different perspectives. Traditionally, the landscape has always been the focal point of scenic wallpapers and murals. Certain manufacturers have prided themselves on their beautiful sky renderings: French factory Zuber perfected the delicate shading of the sky from golden-yellow above the horizon to a beautiful blue above; Dufour firm of Paris was known for its puffy white clouds, skillfully printed with wood blocks. While the museum’s collection includes a more modern scenic paper designed in 1929 with a very low horizon line—said to be designed for modern buildings with lower ceilings—the focus is still the landscape. No manufacturer has ever made the sky the focal point, let alone the only element of the scene. This is truly a unique take on panoramic papers. Karel Martens is a Dutch graphic designer whose body of work spans over 50 years. He received his training at the Arnhem Academy of Art and Industrial Arts in the Netherlands. He has taught graphic design at the university level since 1977, and was appointed to the Yale faculty in 1997 as senior critic in graphic design. Installation, Dutch Clouds, 2011. Designed by Karel Martens (Dutch, b. 1939), digital print on cellulose, latex, nylon substrate. Gift of Maharam. 2012-11-2-1/5.